Discussion in 'Draft Games Forum' started by Skizzo, Apr 13, 2019 at 06:56. Every manager will make 2 choices for each of the 4 regions below. In addition they will choose a birth date timeline (10 years e.g. 1980-89) as added restriction criteria. Overlaps allowed for all categories (multiple managers can have same choices). Managers will not announce their choices out loud or discuss them at all. All choices must be sent to the draft mods in PM. Again, overlaps are allowed, so multiple managers may end up choosing the same manager/club/decade etc. Example: If you land in Box 1 manager will pick a player from his chosen country and born within your chosen decade. Board is split into 4 regions marked by distinct colors. Draft mod-mins will roll a pair of virtual dice every turn and managers will move across the board accordingly. 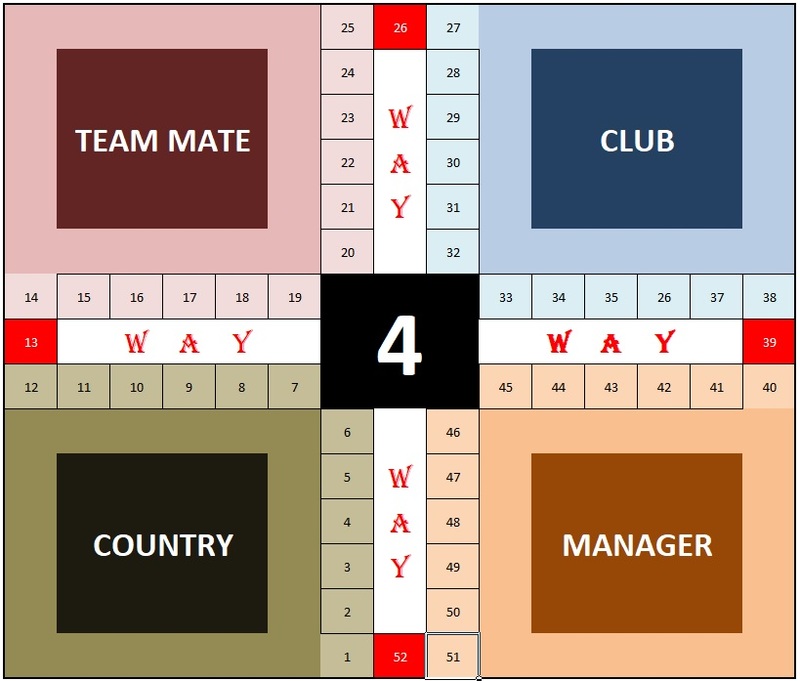 Managers will be randomized and have different starting postions (4 per group) 4 manager each will start at boxes 1, 14, 27 & 40 respectively and then move across the board per dice roll. Every 5th roll (Roll 5, 10... etc) will be be a sheep draft round. If managers end up with a sheep, their next roll is free of decade restriction for one roll only. These are multi-criteria boxes. For example if you land in Box 13, you need to pick a player who has played for country of your choice and with/against your player choice and within your decade choice. If you cannot find a player matching 3 criteria, mod-mins will give you a non GK outfield legacy player at a position of your choice. # Country (x2) - Pick players who played for the respective countries of their choice. This would be their most represented country (by appearances). If equal appearances across 2 NTs, then first played NT would be applicable. # Manager (x2) - Pick players who played for the respective managers of their choice. Played must have played at least 1 match (been on the pitch) under said manager. # Club (x2) - Pick players who played for the respective clubs of their choice. Should have made at least 1 match (on the pitch) for said club to qualify. Pick players who have played with or against your choice players. All choice players are banned for this draft. Chosen players will be announced after they have been PM’d, but who chose them will remain anonymous. Links must be provided on request to substantiate your choice. S.1 - All time draft. S.2 - Initial drafting of 14 players. Extra 1 player per Reinforcement Round. S.3 - 8 hrs per pick. Do not wait or provide extra time. S.4 - Once posted, it's drafted. No change in picks after posting. S.5 - No substitutions. Tactical changes with in-field players only. S.6 - First 3 picks of losing team will not be available during reinforcements. S.7 - Open pool reinforcement. Undrafted players can be drafted now, subject to criteria. S.8 - Draft restricted to FIFA/Affiliated Confederations only. No ISL and such. No NT friendlies. Legacy player list will be put together and announced before drafting starts. Will have about 10+ players for each position, and those players will be unavailable for regular drafting. There are three of us. Skizzo, I will be teaming up with MJJ due to time constraints. @Skizzo @Edgar Allan Pillow how are players rated? career peak or specific ones? if we find Fellaini played in 90s, could we pick him for that decade and use his United peak? Why are you not playing? In addition they will choose a birth date timeline (10 years e.g. 1980-89) as added restriction criteria. Are we a player short? You can start sending those whenever. Won’t start the actual drafting until all those are in, and I’ll be busy today so probably won’t get this going until tomorrow at the earliest anyway. Once we choose a decade, we have to pick players from that decade irrespective of the box we are in, don’t we? Just making sure. Correct. The decade restriction remains throughout, apart from the sheep rounds. Just remember that multiple managers can select the same decade, manager etc, and it won’t be revealed who choose what. Also, decade does not have to be 80-89, or 60-69, it would be 75-84 for example. Would be nice to see an example of how this works. I can't quite get how Ludo fits into the whole thing. Are we taking our picks to home or something? Sorry @Skizzo , I'm out. It's too many restrictions to think about. In the regular game yes there’s an end goal to get your pieces to. In this version you just continue to make your way around until your team is complete. What's everyone using to research their decade? Definitely the hardest part of the restriction that.